THE LARGEST SHIP OF HER TIME, the Great Eastern had a gross tonnage of 18,914. She had a length of 692 feet along her upper deck and a beam of 120 feet across her paddle-boxes. When loaded the Great Eastern drew 30 feet of water. Her keel was laid down at Millwall, on the River Thames, in 1854, and she was completed in 1858. LEVIATHAN of the seas for nearly forty years, the Great Eastern was the largest and most wonderful ship of her time. It was not until a decade after the great vessel had been broken up that her dimensions were exceeded. The design of her hull was completely distinct from those of her contemporaries. In many ways the building methods employed resemble those in use at the present day. The Great Eastern has often been described as “born out of her time”. The idea of building a ship four or five times the size of any other then afloat was conceived in the mind of Isambard Kingdom Brunel about the middle of the nineteenth century. Appropriately enough, the Great Eastern was originally called the Leviathan, and it was Brunel’s suggestion that she should ply between England and either Calcutta or Colombo, where smaller steamers would pick up her cargo and distribute it to its several destinations. Brunei was the creative genius of the Great Western Railway, but he was well acquainted with ships and shipping. It was Brunel who created the dock and harbour works at Monkwearmouth (Co. Durham), Plymouth (Devon), Briton Ferry (Glamorgan), Brentford (Middlesex) and Milford Haven (Pembroke). He designed the wooden paddle ship Great Western and the iron screw steamer Great Britain. The Great Western crossed the Atlantic in 1838. The Great Britain left Liverpool on July 26, 1845, and arrived in New York fifteen days later. She was the first screw steamer to cross the Atlantic, and she was in all ways a successful vessel. There can be no doubt that Brunel’s experience with these earlier ships supplied him with valuable data for the design of the Great Eastern. In 1852 Brunei laid his proposals for a super-ship before the directors of the Eastern Navigation Company, which had interests in the Indian and Australian trade. It had been known for many years that large ships were more suitable than small vessels for long voyages. Apart from greater fuel, cargo and passenger carrying capacity, the large ship was capable of higher speed with less expenditure of power; and coaling stations were few east of the Cape of Good Hope. There was, however, one special difficulty that had to be overcome before a large ship could be depended upon when encountering heavy seas. This was the tendency to break her back, either when supported at bow and stern by only two large waves, or when poised amidships on a single wave which left her bow and stern hanging in mid-air. Brunel overcame the trouble by adopting entirely new methods of shipbuilding. The ship was planned in the form of a huge girder, almost rectangular in section, with a double skin and framing that was arranged longitudinally. These longitudinal frames were 2 ft 9½-in deep, and made of iron plates ½-in thick. They were spaced 2 ft 6-in apart on the flat bottom of the ship, and 5 feet apart to a height of 36 feet at the sides. The deck was also double and of cellular form. Thus the hull comprised a “ship within a ship” from keel to water-line, somewhat as in the liners of to-day. Modern construction, however, employs a different form of framing. The Great Eastern was strongly built, and can be considered not only a bold experiment, but also a triumph for British shipbuilding in the last century. The iron plates of the inner and outer skins were approximately ¾-in thick and secured to the longitudinal frames by angle iron 4-in by 4-in and more than ½-in thick. The safety of the ship was increased by extensive subdivision into watertight compartments in addition to the double skin. These were formed by transverse bulkheads at intervals of 60 feet. In the bulkheads there were no openings below the second deck. There were also two longitudinal bulkheads, 36 feet apart, that extended for 350 feet of the ship’s length. In addition to the main bulkheads there were others at the bow and stern, and in each compartment were intermediate longitudinal bulkheads carried up to the main deck. They formed the coal bunkers. There were two continuous tunnels through the main bulkheads near the water-line. In one of the tunnels was carried the main steam piping. On Brunel’s suggestion two systems of propulsion were adopted and the ship had a screw propeller in addition to paddle wheels. The dimensions of the Great Eastern sound imposing even when compared with many modern liners, except for such mammoths as the Normandie and the Queen Mary. The ship displaced 27,384 tons (gross tonnage 18,914), and her length on the upper deck was 692 feet. The length on the load water-line was 680 feet and the hull breadth was 82 ft 6-in. Over the paddle boxes she was 120 feet broad. The depth at the side of the vessel was 58 feet, and the depth of the hold was 24 ft 3-in. When loaded the ship drew 30 feet of water. The cargo load was 6,000 tons, in addition to the 10,000 tons of coal in the bunkers. The lines of the Great Eastern followed the form that had been in use for some years. She was built by Mr. Scott Russell, the famous ship designer and head of the firm of John Scott Russell and Co, who built her hull, together with the paddle wheels and their engines. The screw engines were built by James Watt and Co, of Birmingham. 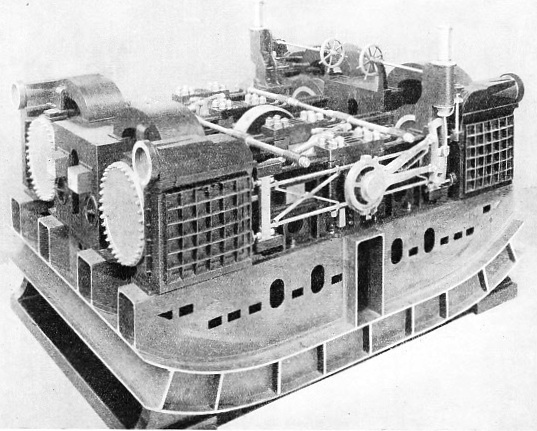 THE DIRECT-ACTING SCREW ENGINES of the Great Eastern weighed 500 tons. This photograph of a working model in the Science Museum, South Kensington, also shows the cellular method used in the building of her double hull. The screw engines, which the Great Eastern carried in addition to paddle engines indicated 4,886 horse-power. The four cylinders were arranged in pairs and had a diameter of 7 feet and a stroke of 4 feet. It was customary, even in those days long before the existence of the wonderful ship-testing tanks at Teddington and elsewhere, to build models to serve as guides to the shipbuilder. The original Scott Russell “builder’s models” of the Great Eastern, made to a scale of ¼-in to 1 foot, are preserved in the Science Museum at South Kensington, with a fine rigged model (⅛-in to 1 foot) and other models of her machinery. The keel plates of the great ship were laid down in 1854 at Millwall, on the River Thames. Few people can recall the time when Millwall rang to the sound of riveter’s hammers, building liners for Great Britain’s expanding trade, great battleships, and fast cruisers for the protection of the ocean routes that reached the ends of the earth with British commerce. London in those days was a busy shipbuilding centre, until by force of economic circumstance her status changed to that of port for cargoes - the greatest port in the world. After nearly four years of toil the Great Eastern’s huge iron hull, weighing tons, was ready for her launch. Brunel insisted that the launching should be carried out “broadside-on” to the river, for the Thames at Millwall was too narrow for a lengthways launch to be made successfully. Therefore, at Brunel’s suggestion two great iron cradles, each 80 feet square, were erected at bow and stern. The cradles were placed on inclines, 80 feet wide and 200 feet long, leading down to the water with a slope of 1 in 14. When the day of the launch arrived, with fitting ceremony the huge vessel was started on her way to the water. Unfortunately, in the anxiety to avoid “overshooting” the river, the progress of the launch was prematurely arrested. The iron cradles stuck on the slipways, also of iron, and the vessel came to a standstill. For three months the ship remained on the launching ways, and not until January 31, 1858, was she safely afloat. The launch was accomplished only by the use of extensive hydraulic machinery, costing thousands of pounds, that pushed the 12,000-tons hull inch by inch into the Thames. The unexpected and expensive delay in the launching of the Great Eastern led to the liquidation of the company in whose service she was intended to run. She was sold to another concern for service on the northern route across the Atlantic. The ship was unsuited for the Atlantic trade, for she had been intended for voyages to the East. Herein lay one reason for her financial failure in later years. The Great Eastern was not ready for her trial trip until September 1859, five years and five months after the laying of the keel plates. The strain of controlling this vast enterprise had told heavily on Brunel’s health. On September 5, 1859, the great engineer saw the engine trials of his but when he returned home on that day he was seized with a paralytic stroke. Ten days later he died. The Great Eastern made her first voyage across the Atlantic in June 1860, at an average speed of nearly 13 knots, with an average coal consumption of 551 tons a day. The technical details of her paddle machinery are given on page 428. The four great cylinders of the paddle engines had a diameter of over 6 feet and a stroke of 14 feet. They must have presented a magnificent spectacle as they swung ponderously backwards and forwards on their trunnions. With a flash of polished cranks and massive big-ends the powerful piston rods drove in and out of the ringing cylinders, turning round the great two-part paddle shaft - more than 100 feet long - ten times a minute. The weight of each paddle wheel was ninety tons. The original wheels were 56 feet in diameter, but these were torn off by giant seas during a great gale in 1861. New and stronger wheels, 50 feet in diameter and with narrower floats, were later fitted and these lasted the life-time of the ship. On her trials the Great Eastern, using her paddles only, achieved a speed of 7¼ knots. Four boilers, each weighing 50 tons and holding 40 tons of water, supplied steam to the paddle engines which indicated 3,411 horse-power. These engines weighed 836 tons. 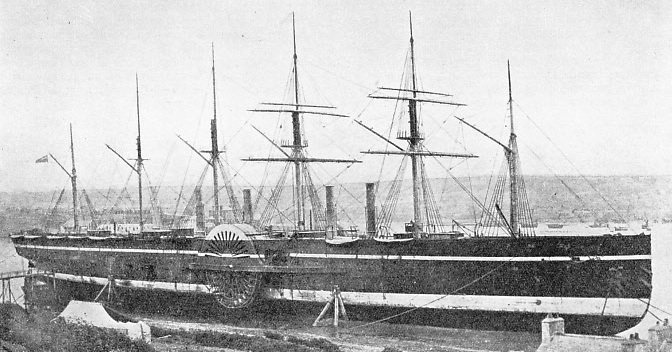 The screw engines of the Great Eastern were of 1,600 nominal horse-power, but developed 4,886 ihp. They weighed 500 tons. There were four cylinders with a 7-feet diameter and a 4-feet stroke, arranged in pairs on opposite sides of the crankshaft. Every cylinder had two piston rods terminating in a crosshead moving in guides. The two cranks of the engines were set at right angles with a disk balance-weight between them. The starboard crossheads were connected to their opposite cranks by single connecting rods. On the port side, however, the connecting rods from each crosshead were doubled. There were thus three connecting rods attached to each crank. Four jet condensers were arranged between the cylinders and contained horizontal air-pumps worked from the crossheads. The large slide valves were moved backwards and forwards on rollers, and relief frames and rings were interposed between the backs of the valves and the inside of the steam chest covers to reduce pressure on the working faces. The valve rods of opposite cylinders were joined by a framework reciprocated by a link motion reversing gear. The propeller was carried on a shaft 150 feet long that weighed 60 tons. The screw of the vessel was larger and heavier than any fitted to the Queen Mary, but it must be remembered that the giant of 1936 has four propellers. The earlier wonder-ship had only a single screw and this was of cast iron, not bronze. It had a diameter of 24 feet and weighed 36 tons. To avoid the drag of an idle propeller, an auxiliary engine kept this screw revolving when the ship was proceeding under paddle power only, with or without the sails. The screw engines alone gave a speed of 9 knots and were supplied with steam by six boilers, each weighing 55 tons and cont-aining 45 tons of water. There were thus ten boilers in all and they were served by five funnels - an interesting comparison with even larger ships that to-day carry but one funnel, and that mainly for ornament when the motive power comes from diesel oil engines. In the days of the Great Eastern men had not learned to put their trust in steam alone. So this ship was provided with sails. Six masts carried a spread of 6,500 square yards of canvas - white wings to the extent of nearly one and a half acres. A CONTEMPORARY PHOTOGRAPH OF THE GREAT EASTERN beached for examination. Her original paddle wheels were 56 feet in diameter and weighed 90 tons. These enormous wheels were torn off during a gale in the Atlantic in 1861. They were replaced with stronger paddles 50 feet in diameter. The paddle engines indicated 3,411 horse-power and drove the Great Eastern at 7¼ knots on trial. There were no fewer than twenty anchors and these with their chains and cables weighed altogether 253 tons. The passenger accommodation seems to have been ruled by considerations of quantity rather than quality. There were cabins for 800 first class, 2,000 second class and 1,200 third class passengers, and it is stated that as a troopship she could have carried 10,000 men. This last figure would appear to indicate a certain amount of overcrowding among the troops. No mention is made in the ship’s records of swimming pools, sports decks, tennis courts, marble lounges or luxury suites. The ocean traveller of to-day certainly benefits greatly by the improvements that have been made in passenger accommodation since the time of the Great Eastern. In September 1861, during a great storm at sea, the Great Eastern came near to disaster. She encountered heavy seas when about 280 miles west of Cape Clear, Ireland. With the increase of the gale, the captain ordered the setting of sails to keep the head of the ship to the wind, but these had scarcely been set when they were blown to shreds. After a heavy sea had struck the ship, a grating noise was heard in the paddle boxes and it was found that the port wheel had become bent and was scraping against the side of the ship. The other paddle was also smashed and the captain ordered the paddle engines to be stopped as there was a danger that the wheels would tear holes in the ship’s sides. The screw had been put out of action by the jamming of the rudder. The seas were described by eye witnesses as “running mountains high” with the ship rolling over on to her beam ends so that at times the decks were at an angle of 45°. The ship continued to roll in this fashion for many hours and practically everything movable on board was smashed to pieces. In this gale the paddle wheels were torn right off the ship, and the rudder post, a piece of iron 10-in in diameter, was smashed. In addition, six of the lifeboats were swept away and two more were dashed to pieces. Between twenty and thirty of the passengers were seriously injured with fractured limbs. It is noteworthy that during this gale a small sailing brig, the Magnet, of Nova Scotia, stood by the stricken steamer to render assistance if required. Eventually the Great Eastern limped into Cork Harbour. Although the Great Eastern was not a commercial success either as a passenger or a cargo vessel, she did much useful work as a cable ship. An Atlantic cable had been laid in 1856, but it subsequently failed and the Great Eastern was chartered to lay a new cable in 1865. The ship left Yalentia, Ireland, at the end of July 1865. On August 2 the cable broke after 1,200 miles had been paid out. The following year, on July 13, the Great Eastern again left Ireland in an attempt to complete the cable partly laid and at the same time to lay another new cable. The steamer laid the new cable across the Atlantic in fourteen days. She then steamed eastwards again and on August 13, 1866, made her first attempt to recover the broken end of the cable that had been lost in the previous year. After many failures the cable engineers were successful in finding the broken end on September 2. The end of a new cable was spliced on and the remainder of the cable laid. Prominent in these cable-laying operations was Daniel Gooch, Brunel’s assistant on the Great Western Railway. Gooch was knighted for his services in the laying of Atlantic cables and later became, chairman of the railway company. After the conclusion of her cable-laying activities the Great Eastern was sold in 1873 by order of the Court for a sum of £25,000. The original cost of the vessel had been £900,000. Later the Great Eastern was again sold and used as a floating fair and exhibition. In 1887 this wonderful ship was finally disposed of and broken up on the River Mersey. An unlucky ship, she had carried a corpse on board throughout her career. On opening the double bottom of her hull the ship-breakers discovered a skeleton in one of the compartments. It was that of an unfortunate man who had been trapped during the building of the great hull. SECTIONAL PLANS OF THE GREAT EASTERN. The upper photograph shows a plan of the spar deck, illustrating the positions of the five funnels and six masts. The lower sectional plan of the Great Eastern shows the screw engines placed aft and the paddies with their engines amidships. The main and longitudinal bulkheads formed spaces, some of which were used as bunkers to carry 10,000 tons of coal. You can read more on Cable Ships at Work and the Laying the Ocean Cables in Shipping Wonders of the World.